Beauty and the Beast 3D Movie Trailer. Watch Disney’s Beauty and the Beast 3D re-release movie trailer. 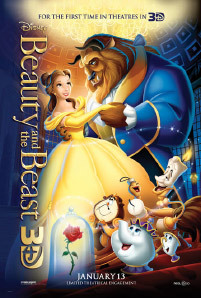 Belle is a bright and beautiful young woman who’s taken prisoner by a hideous beast in his castle. Despite her precarious situation, Belle befriends the castle’s enchanted staff — a teapot, a candelabra and a mantel clock, among others — and ultimately learns to see beneath the Beast’s exterior to discover the heart and soul of a prince. Walt Disney Pictures’ magical animated classic “Beauty and the Beast” returns to the big screen in Disney Digital 3D, introducing a whole new generation to the Disney classic with stunning new 3D imagery. The film captures the fantastic journey of Belle, a bright and beautiful young woman who’s taken prisoner by a hideous beast in his castle. Despite her precarious situation, Belle befriends the castle’s enchanted staff — a teapot, a candelabra and a mantel clock, among others — and ultimately learns to see beneath the Beast’s exterior to discover the heart and soul of a prince.